We're reaching the End of Summer... 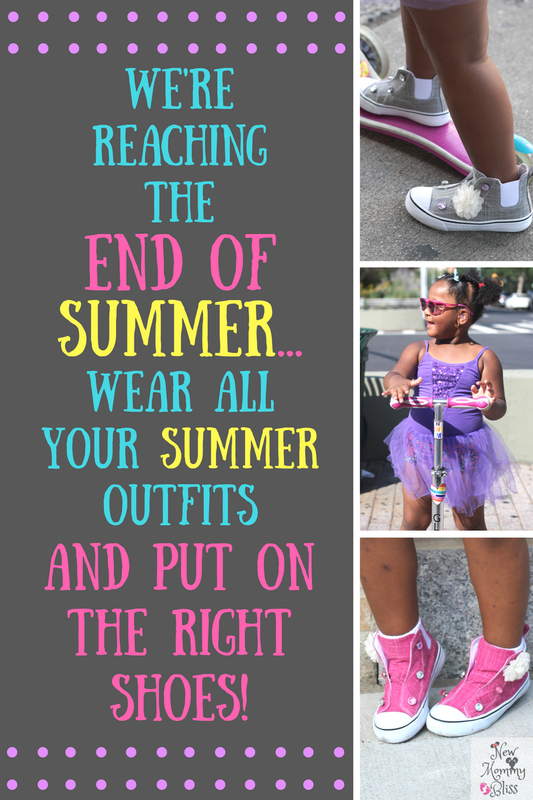 Wear all your Summer Outfits and put on the right Shoes! Now don't get me wrong... I love the fall. But each year that passes has me wondering why was summer so short? Could it be because of all those ridiculous weather changes? Maybe. In an attempt to make the most of our Summer and any money spent for the "Summer" clothes we decided to wear it all! Not in one day obviously, but until the very last day of the warm weather season. I really don't like looking into the closet and seeing that cute little outfit that I couldn't wait to dress her in go to waste. 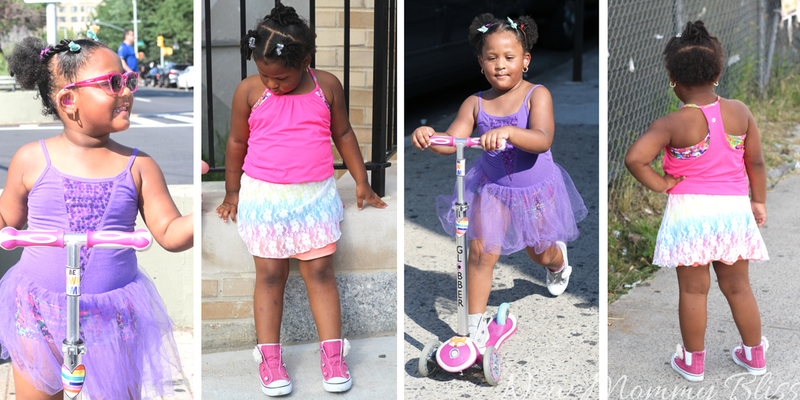 If it's hot enough to wear a Tutu and shorts while you ride your scooter, then darn it baby, so be it! What's making this task so easy though is definitely the footwear. 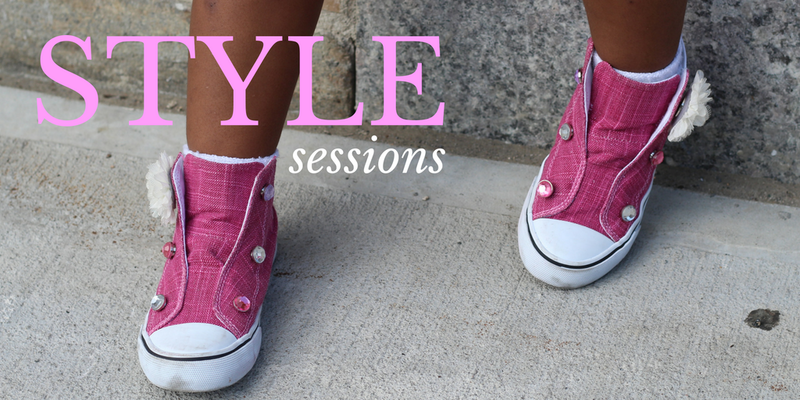 Made-To-Be was awesome enough to let us bring home 2 pairs of the cutest customizable sneakers! Made-To-Be is a customizable & interchangeable lifestyle brand with a twist. We can twist on and off interchangeable embellishments known as "Em-be's" on all their footwear products to create a personalized look. We've had lots of fun matching the shoes to the outfits and all it took was a little twisting. The site hasn't opened up to the public yet, but their initial product launch will include shoes with Em-be’s (detachable and interchangeable embellishments). 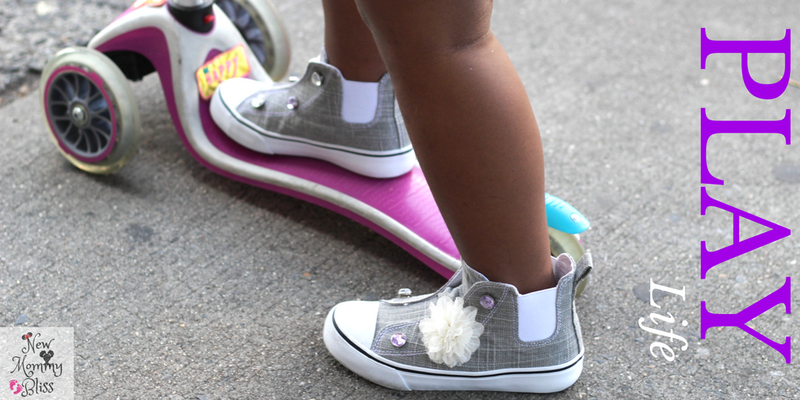 Their shoe line will include sandals, sneakers, and flats that can be customized by adding made-to-be Em-be's. I truly love how their assortment of Em-be's include twist on flowers, gems, and hanging charms. I love how the different flowers make the shoes look completely different each time. We can go from Classy to Sassy in an instant. These are by far my favorites right now. The best part? NO LACES! It's just an elastic that holds your foot in. Not only that, but they've designed the toe cap to be a little more open than others. Perfect for the chubby foot kiddo or the thick sock wearer. As Summer continues to wind down, you'll continue seeing us dressed up in the summeriest of outfits. All made easy since we found our shoes that were Made-To-Be. Loving your "summerist" of outfits idea! I am sad that summer is ending, but so far its been CRAZY hot and humid...so I dont feel like summer has left quite yet! Ready for some cooler temps! My daughter is obsessed with shoes and each pair has to go with her outfit just right. haha I'm not sure where she got that from! Those shoes are adorable. They really add pizazz to the outfit. So cute! Ii adore those high tops! I would totally wear those and I'm an adult! thankfully, I have really tiny feet and can get by with some larger kids sizes! She is SO stinking cute. And I totally agree. If it is hot enough to be in a tutu...put on that dang tutu! Too cute. Those are the kinds of shoes the twins love to wear to school. I will check this out. OMg how cute are those shoes. My nieces would love them so much. The shoes are so cute. I love the pink but I'd want to buy the other pair too. I can't say that I am sad to see summer go. The older I get, the worse the heat makes me feel. I am looking forward to fall. Those sneakers are just too cute! My girls would love to have something like that! I love the gray plaid. my nieces are going to love these when they become available to the public. These shoes are so cute and fun! I love being able to keep summer clothes in style! That pink top with the rainbow skirt is really adorable! I love the outfits and if you put a jacket over those she can still wear them during the school year! This is such a cute concept. I am really feelin' the style of the grey pair the most. I love the idea of this company. And those shoes? Those are the cutest!! Those are adorable shoes!! Perfect for a fun, active day! I LOVE how these shows can be adapted. Summer passes too quickly. Let them wear the tutus and fairy wings as long as you can!